These muffins are made by mixing boiling water with cocoa powder, which brings out the most intense chocolate notes. The addition of bananas and macadamia nuts makes these muffins exceptionally flavorful. They are great for breakfast and snacks. I like them either at room temperature or warm. They can be warmed in a 350-degree oven for 10 to 15 minutes. Center a rack in the oven and preheat the oven to 375 degrees. Line each cavity of the muffin pan with a cupcake paper, or cut parchment paper into twelve 5-inch squares and line each cavity with one of these squares. They will naturally form pleats as they line the cavities of the pan. Place the butter in the bowl of an electric stand mixer or a large mixing bowl. Use the flat beater attachment or a handheld mixer to beat the butter until light and fluffy, about 2 minutes. Add the brown sugar and cream the mixture well. One at a time, add the eggs, stopping to scrape down the sides and bottom of the bowl with a long-handled rubber spatula after each addition. Use a fork to mash the bananas in a medium bowl. Add the yogurt and vanilla and chocolate extracts and blend together. In a large bowl, sift together the flour, baking powder, and baking soda. Add the salt and toss to blend. Add this mixture in 3 stages, stopping after each to scrape down the sides and bottom of the bowl to promote even blending. Add the nuts and stir to distribute evenly. Use a 2-inch-diameter ice-cream scoop to divide the batter evenly among the cavities of the muffin pan. Bake the muffins for 25 minutes, until a cake tester or toothpick inserted comes out clean. Remove the muffin pan from the oven and transfer it to a rack to cool. Carefully lift the muffins from the pan and serve them warm or at room temperature. Store the muffins in an airtight plastic container between layers of waxed paper or on a lined baking sheet tightly covered with aluminum foil at room temperature for up to 4 days. To freeze up to 4 months, wrap the container tightly in several layers of plastic wrap and aluminum foil. Use a large piece of masking tape and an indelible marker to label and date the contents. If frozen, thaw overnight in the refrigerator and bring to room temperature before serving. 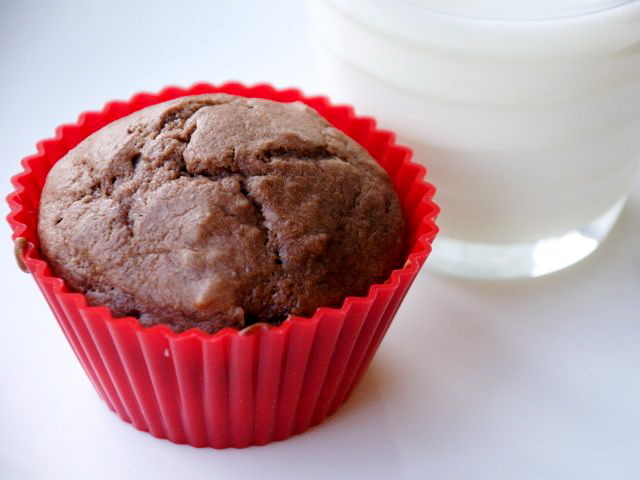 To make Mini Cocoa Banana Muffins, divide the batter evenly among silicone mini-muffin pans. Bake 18 to 20 minutes, until a tester or toothpick inserted into the center comes out clean.